This year's event will celebrate the golden age of British branch lines, with a range of Great Western Railway tank engines taking centre-stage. A cast of 10 trains will steam through the Severn Valley between March 15 and 17, including four extra-special visiting engines. The busy three-day timetable of services includes the Spring Steam Gala Sunday Lunch Train on March 17. One of the stars will be the Great Western Railway Large Prairie No. 4144, which hauled passenger services in South Wales for years before it was withdrawn from service in 1965. The GWR Large Prairie No. 4144. Photo: K Felstead. The engine was rescued from a scrapyard and has been restored to full working order. 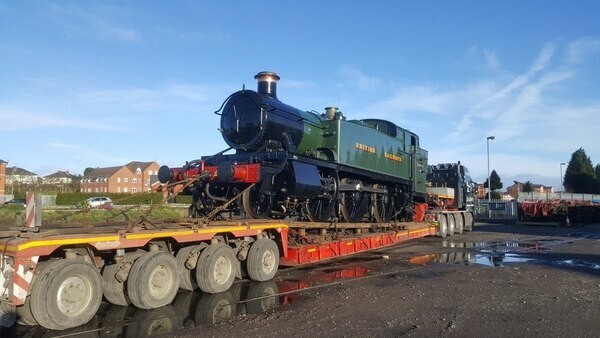 It arrived at the Severn Valley Railway headquarters in Kidderminster on Thursday. Nikki Davies, the Severn Valley Railway’s marketing and communications manager, said: “We’re thoroughly looking forward to launching our 2019 events season with this fantastic celebration of steam. Also heading across the border to join the line-up is the GWR Pannier Tank No. 6430, which was based at Pontypool and Newport from 1940 until 1954, where it worked in the South Wales Valleys. Another visitor will be GWR 5600 No. 5619, which was based at Barry during its working life. Purchased from the Woodham Brothers scrapyard in 1973 by the Telford Horsehay Steam Trust, the engine was returned to steam in 1981 and has visited many preserved railways across the UK since. The fourth and final visiting engine will be the London and North Western Railway ‘Coal Tank’ No. 1054. Built in 1888, No. 1054 is the oldest visiting engine at this year’s Gala. Fitted with a snowplough at Abergavenny, No. 1054 made its name by working the last passenger train over the Merthyr & Abergavenny Railway on January 5, 1958. The visitors will be joined by six of the SVR’s resident locomotives, including BR Standard 4 No. 75069, which hauled its first passenger service in 24 years in the recent half-term holidays, following the most extensive restoration project in the SVR’s history. For more information or to book railway tickets, visit svr.co.uk or call 01562 757900.